The middle Tennessee weather has been warming over the last few weeks, although winter’s grip can be seen on a few mornings when the frost must be scraped from the car windshields. I’ve cut the lawn a few times already and that has given me time to ponder the garage upgrade for the new hobby space. That’s the garage in the above image; my future hobby haven. After the recent grass cutting, I surveyed the garage to determine a plan of attack. 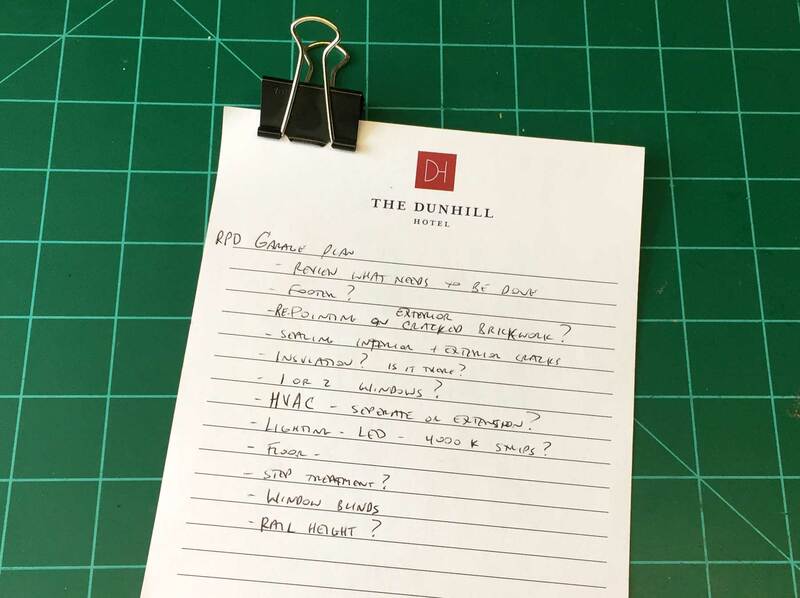 Like most modelers, I made a list. As with any list, there are a few questions. I need to bring in a structural engineer to look over the project as there are cracks in the exterior walls and floor. What else would you expect from a 35 year old home? There are also basic construction issues to understand in order to line up the proper people. I’ve been warned that the booming economy here makes it difficult to find a contractor to do small jobs like the garage upgrade. I’m kind of expecting a bumpy ride. 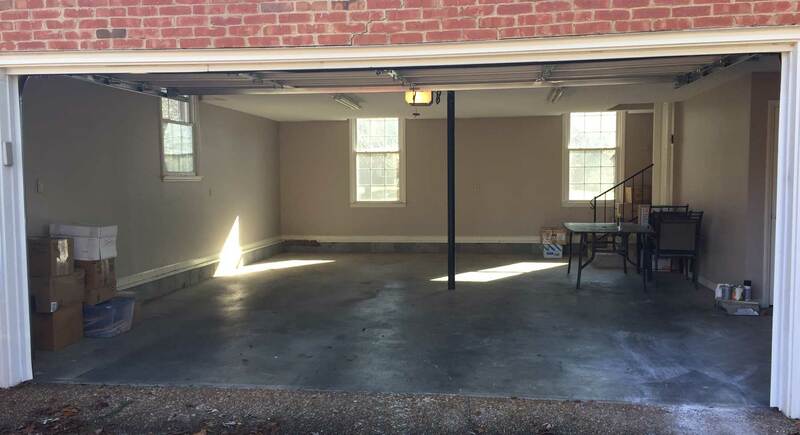 Few homes here have basements, so a garage upgrade is the plan. About those cracks . . . unless you’ve noted movement in the last few years, I wouldn’t worry about them. All buildings and maybe especially houses settle some, and it’s generally not very noticeable in a wood sided house, but brick houses show it more. You might have a mason point the cracks on the exterior because that’s your weather barrier. Insulation? Absolutely! Best would be blown-in foam (not urea formaldehyde, still legal in some places) or blown-in cellulose, from the interior side, since you can then repair the openings. You want a room that has as minimal a temperature swing as possible, because it can raise havoc with trackwork (ask how I know!). And the windows . . . unless you plan an island layout, and not around-the-walls, i’d leave them, but be aware that the sun will fade scenery over time. And if you do want to close them up, I’d make some sort of reversible closure on the interior, in case you ever want to sell the house. The next owners may want the windows. Also think about the security aspect of your layout being visible through the windows; vandals do stupid things, you know. I’d protect the investment in the models and your time to build the layout. One thought on the HVAC: Kansas City. MO., where I live, prohibits using connected HVAC in a garage due to concerns of possible carbon monoxide posioning. And of course I’m sure you’ve thought your existing systerm might not be up to adding over 500 square feet of additional space to heat and cool. How much is designated hobby space? Will you need to keep one bay for a vehicle? Those windows in the back let in a lot of light, would be shame to remove them. But the side window I’d cover up, though it could be above rail height anyway. If it’s all hobby space, what about making workbench area at the back with the windows, and making the front 2/3 – 3/4 the layout area? Must be ‘fun’ getting to start over with a fresh set. Beats a 100+ years old basement – right? Sometimes, there is no footer under the garage door area. I would think you should check that before a permanent wall is installed. is the house on a crawl space? or slab? I noticed stairs to the first floor. You might consider a plywood floor raised a bit from the concrete. It might be warmer and easier on the feet. Does the garage face the street? Consider a passage door to the back or side yard. You will want to do your woodworking out there, and not in the garage. I would think you would want an outside exit from the now room anyway. then the guys don’t have to tramp through the house. One problem I have is the window in one corner of my basement room. I really destroys the lighting effect. I have hardboard to cover the window. I can remove it for using the airbrush inside. there – that should occupy you for 10 years. We’ve driven through TN a couple of times this year. We do have to get out of the cold occasionally. Eric, did you consider either adding styrofoam panels to insulate the garage door (kits are available at lowes/home depot) or consider getting a new insulated garage door. If you ever decide to move, it may be to your advantage to leave the garage door as is for resale. I added a new insulated door to my last house and you would not believe the difference. If your adding HVAC look at a split system.